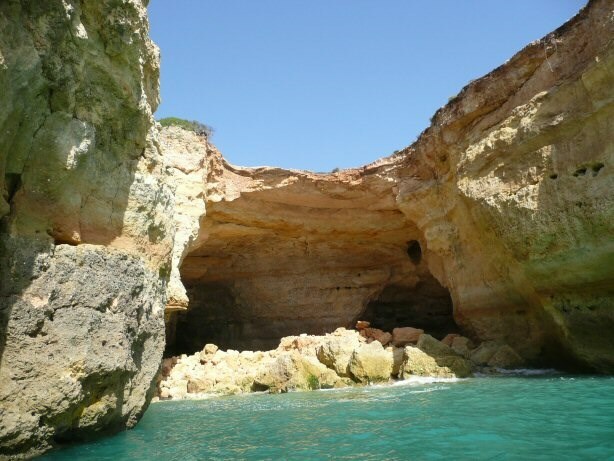 “Algares” (natural Pits) are peculiar forms of relief shaped amongst the limestone rocks that make up the Algarve coastline. These formations, associated with naturally eroded limestone geomorphology, include a series of cavities with a variety of shapes and sizes. They arose and evolved as a result of both chemical and mechanical erosion over millions of years. Extensive fracturing of limestone structures encountered in this area facilitates the infiltration of rain water which, due to its high carbon dioxide content becomes acidified and dissolves the limestone. This continual process progressively increases the cracks in both width and depth, and gradually form natural pits, known in Portuguese as “algares”. Naturally eroded cavities are sometimes filled with reddish colored, sandy-clayey deposits which offer little resistance against sea and land surface erosion. The fast erosion of these deposits in amongst the limestone structure means they are swept away from the coastline, leaving the rocky outline with its intricately sculptured shape, and many conspicuous rocky edges and islets, e.g. the one called Seagull Rock. 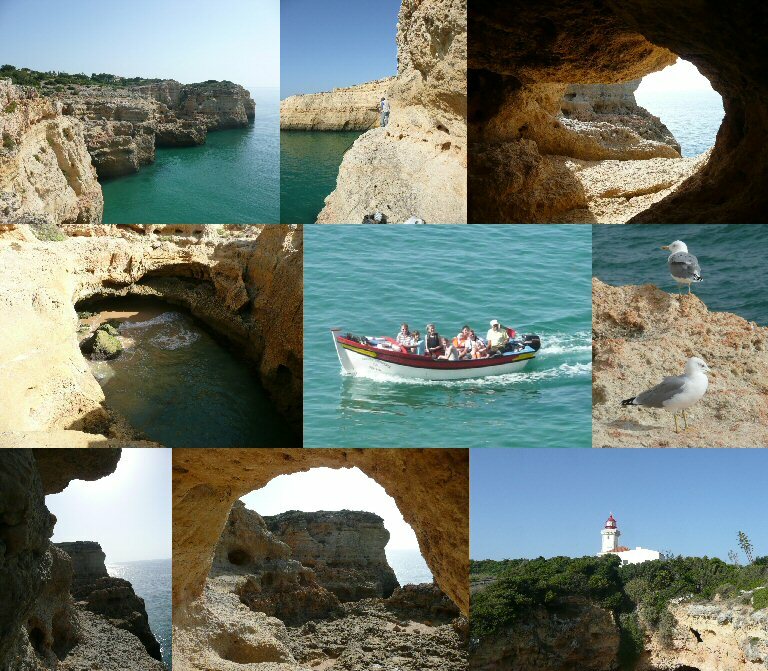 In the Lagoa municipal area, the limestone rocks that form these pits and caverns are the basic lithological foundation of the cliffs, and form an extremely attractive stretch of coast. You need to be free from giddiness and wear good shoes. Be careful! You do the cache on your own risk. Park your car at N37 05.261 W8 26.565 and walk along the coast east to N37 05.185 W8 26.358. From this point you get an idea of the terrain and the further way to go. Continue your tour to N37 05.190 W8 26.292. You reach the final point at N37 05.173 W8 26.267 on a small path along the steep coast (see picture above). Be careful! 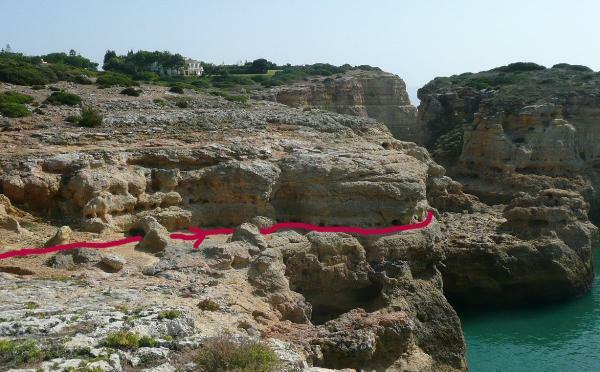 You can continue your tour, if you leave the cave south and climb down the rocks to the plateu. From here on the terrain rating increases to 4!